For instance, only recently, radioactive cesium in tunnels at Fukushima suddenly spiked by more than 4,000 times similar measurements from one year ago. This spooky/huge spike in radiation levels hit 482,000 Becquerels per liter. TEPCO intends to investigate the reason behind the enormous anomalous increase, Radiation Spikes in Fukushima Underground Ducts, NHK World, Dec. 9, 2015. Over the course of a year, 4,000 times anything probably is not good. Not only that but the barrier constructed at the Fukushima nuclear power plant to hopefully prevent contaminated water from leaking into the ocean is tilting and has developed a crack about 0.3 miles in length along its base. The wall is 0.5 miles long and 98 feet below ground. An ocean barrier, indeed: “Higher levels of radiation from Japan’s 2011 Fukushima nuclear accident are showing up in the ocean off the west coast of North America, scientists from the Woods Hole Oceanographic Institution reported,” Higher Levels of Fukushima Radiation Detected Off West Coast, Statesman Journal, Dec. 3, 2015. Fortunately, so far, the detected levels still remain below U.S. government-established safety limits. In the meantime, TEPCO battles one of the most perplexing disasters of all-time with an average number of daily workers more than 7,000. The difficulty of procuring workers at the site is beyond imagination. Homeless people are hired off the streets to do the dangerous decontamination work. The situation better get better really soon because the Olympics are scheduled for 2020, which brings to mind perilous lost corium, the sizzling hot melted core in Plant #2, that hopefully, keeping one’s fingers crossed, has not burrowed into the ground, spreading deadly isotopes erratically, ubiquitously throughout. Still, nobody knows where this Missing Corium-Waldo of the Nuclear World is located. Meanwhile, Greenpeace/Japan accuses the International Atomic Energy Agency (IAEA) of downplaying the health risks of the 2011 Fukushima disaster and accuses the agency of acting in concert with Japanese Prime Minister Shinzo Abe’s attempts to “normalize” the disaster, Greenpeace Japan: IAEA Downplays Dangers of Fukushima Disaster, Sputnik News, Feb. 9, 2015. Hurry, hurry, the Olympics is coming! 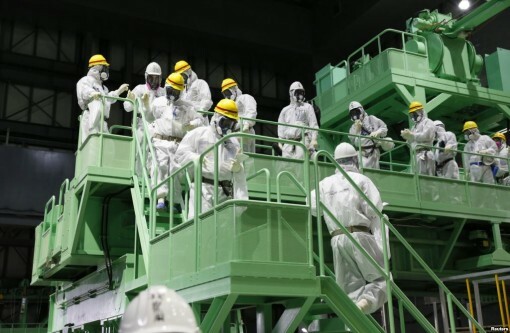 One clever approach to the problem of too much radiation is to increase the “allowable limits”: “The permissible annual level of radiation exposure has been dangerously heightened in Japan after the March 11th accident. One (1) millisievert (mSv) has been elevated to 20 mSv for residents in affected areas. The government increased the annual limit for nuclear workers’ radiation exposure from 100 mSv to 250 mSv in ‘emergency situations,” Mitsuhei Murata (Executive Director of Japan Society for Global System and Ethics and former Japanese ambassador to Switzerland) Nuclear Disaster and Global Ethics, UN World Conference on Disaster Risk Reduction, March 16, 2015. Recent studies confirm “exposure to low levels of radiation can cause cancer,” specifically, “No matter whether people are exposed to protracted low doses or to high and acute does, the observed association between dose and solid cancer risk is similar per unit of radiation dose,” (Source: British Medical Journal, Press Release, Low Doses of Ionizing Radiation Increase Risk of Death from Solid Cancers, International Agency for Research on Cancer, WHO, Oct. 21, 2015). In sharp contrast to Japan’s position, Chernobyl’s officialdom has a different take on “permissible annual radiation exposure,” specifically: “The radiation limit that excluded people from living in the 30km zone around the Chernobyl nuclear plant exclusion zone was set at 5mSV/year, five years after the nuclear accident. Over 100,000 people were evacuated from within the zone and will never return,” (Greenpeace Japan). Never ever return! Nuclear disasters don’t go away easily. For example, Chernobyl is already facing a brand new crisis. The durability of the original decaying blighted sarcophagus expires within the next 12 months. However, the new replacement sarcophagus, the world’s biggest-ever metallic dome, will not be accomplished in time as they are short of funds (615million EUR). In addition to Ukraine’s internal strife with pro-Russian citizens, the country has serious financial difficulties. All of this amounts to one more “spoke in the wheel” against nuclear reactor proliferation (Incidentally, China has 400 reactors on the drawing board). Who knows if and when a crippled reactor ends up in the hands of a financially strapped country? Then what? Already, Ukraine has 15 nuclear reactors standing tall, so far, amongst whizzing bullets and powerful rockets. Dismally, Ukraine has conceivably become a nuclear holocaust tinderbox in the midst of cannon fire, rumbling tanks, and surface-to-air missiles, for example, Malaysia Airlines Flight 17 was shot down by a missile, supposedly by accident, on July 17, 2014, all 298 on board died. But, wait a moment; the Olympic Committee has already designated Tokyo 2020. Is it possible the IOC has the cart ahead of the horse, maybe way ahead? As for the newly established higher acceptable Japanese limit for radiation: “This is not only unscientific, it is also unconscionable,” Dr. Fairlie, Unspoken Death Toll of Fukushima: Nuclear Disaster Killing Japanese Slowly, Sputnik International, Aug. 8, 2015. After all, on a factual basis, “unscientific and unconscionable” are strong indictments. Yet, the Olympic committee has already approved Tokyo 2020, and people from around the world will be making plans to attend. Withal, if the Olympic Committee is okay with Japan’s capricious radiation conditions, then shouldn’t everybody else be okay with it too? Well…. All of which brings to mind: If Fukushima’s a canary in the mineshaft that exposes nuclear power’s hidden dirty underbelly, meaning, once things go wrong they really go wrong, adhering to Murphy’s Law, then what of the potential consequences of big ole nuke plants in war zones? How would Murphy’s Law apply in a war zone? The most comfortable answer is: Don’t even think about it. Thus, Fukushima may be more than the poster child of nuclear power’s fragility vis a vis extreme forces of nature; it’s also a surrogate poster child for lurking dangers behind and within terrorism and within war zones when “anything that can go wrong will go wrong,” for example, a downed airliner over Ukraine. Rockets have been fired at nuclear facilities in Israel. “Hamas claimed responsibility for the rockets, stating that it had been attempting to hit the nuclear reactor. Militants from Hamas’s Qassam Brigades said they had launched long-range M-75 rockets towards Dimona” (The Jerusalem Post, July 9, 2014). As mentioned earlier, Ukraine is home to 15 nuclear reactors in the midst of a war zone. What if a missile accidentally, or purposefully, hits a nuclear reactor? Does Fukushima provide any clues as to the consequences of such a disaster? Postscript: “The future of the Olympic Games is at stake. It is as a believer in the spirit of the Olympic Games and the Olympic Movement that I am pleading for an honorable retreat, and this, in order for Japan to devote maximum efforts to controlling the Fukushima crisis,” Mitsuhei Murata, Former Japanese Ambassador to Switzerland and Executive Director, Japan Society for Global System and Ethics, Tokyo, October 28, 2015.